In order to manage your customers base you will need to know how to fully manage their accounts. SugarCRM CE is conveniently structured in 3 major modules and in the next few lines of this tutorial we will review the Accounts of the Sales module. In order to fully manage the accounts on your website you will need to first access the dedicated page for all of those. Once you login that page is located under Sales > Accounts. Once you click on that link you will be redirected to a page where you will be presented with a table view with all of the customers you have created accounts for already. In order to create a new customer's account you will need to simply click on the Create Account button from the top action bar. Shipping Address - The shipping address of the customer. The last section is called "Other" and it has a single field called "Assigned to". There you will be able to configure if this account should be assigned to a representative of your company. The editing of accounts created for your customers in the SugarCRM CE application is relatively simple. 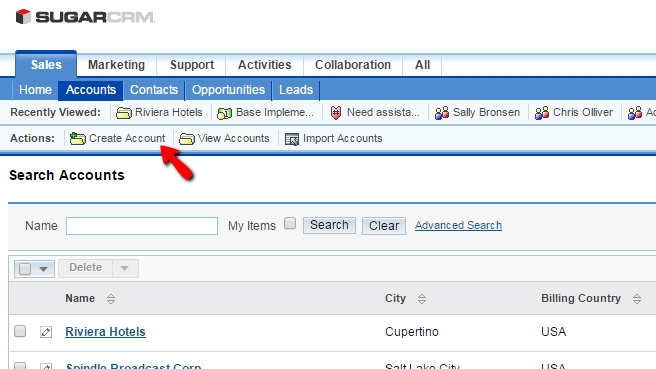 Once you access the Accounts page of your CRM you will be able to search all the accounts using the search module at the top of the page. Once this has been done and you have found the contact you need to edit, you should click on the small pencil-like button before the name of the contact so you can be presented with the editing page for this contact. The editing page is nothing more than the accounts creation page, however with most of the options already configured. Once you are done with the editing please press the Save button so you can be able to save the information. Last but not least we will review the deleting action which is quite simple. Once you find the contact you would like to delete you will need to select it and then simply use the Delete button located at the top of the accounts table view. Next you will need to simply confirm the deletion and the account will be properly deleted. Congratulations! 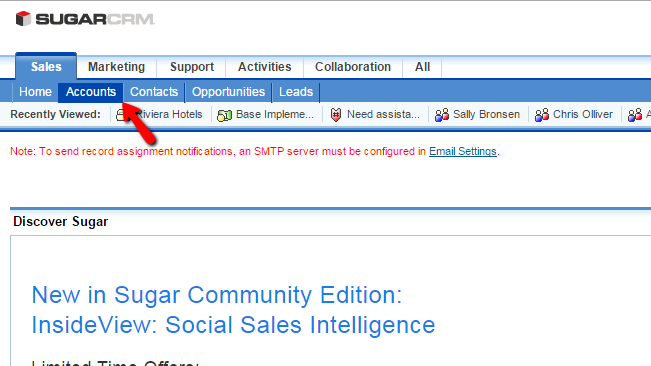 You now know how to fully manage the Custommers' Accounts on your SugarCRM CE installation!